I hate to keep writing about corrections and being a fear mongerer. 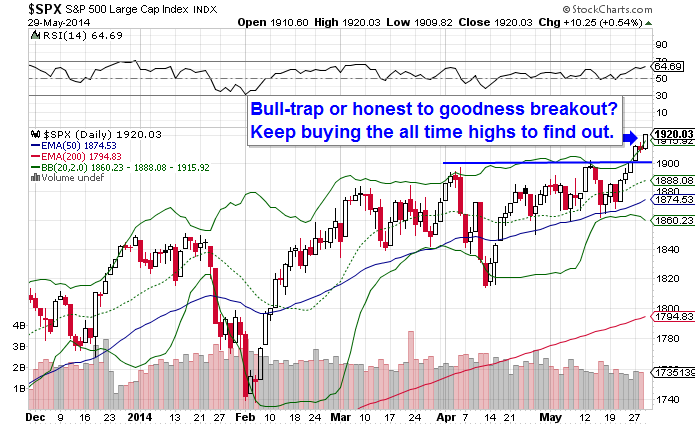 At this point, it’s pretty useless as the S&P 500 stays constantly bid under all conditions. The last little correction lasted a week exactly and took the SPX down approximately 4%. Before that was the approximate 6% correction we saw from January 23rd to February 3rd. That was 11 days and a casual observer of the market would have thought the rails had come off of everything the way sentiment crashed so quickly. However, we seem to have experienced a “clear” breakout so we’re not technically talking about a triple-top anymore…unless it’s a bull trap. Is it a bull-trap? Hindsight will inform us. In my humble and probably very ignorant opinion, I think it’s a bull-trap. There’s just enough buying power left to draw in some last suckers before corrective action. It’s not unheard of for a third top in a triple top to be higher than the first two. The tape shouldn’t be ignored but neither should the myriad of signals running counter to the tape. Of course, I could be wrong. I’ve been early to the short party before, and I took a couple lumps to my account and ego for being a wannabe, turn-calling notshot. I maintained tight stops so the damage was minimal, but top calling is a suckers bet that continues to be fun to make. Complacency is the topic du jour around the financial blogosphere and professional commentaries. 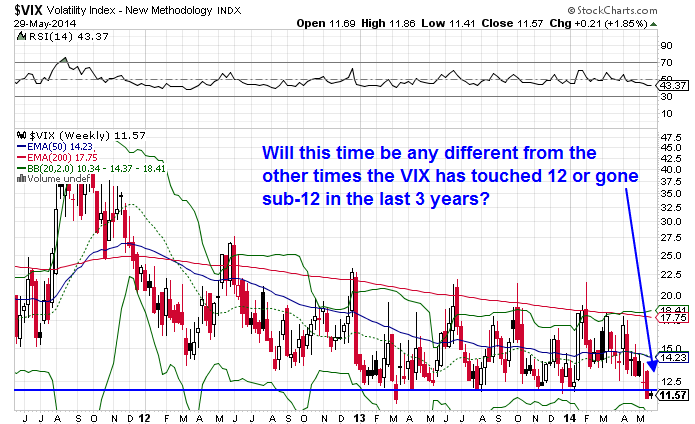 The VIX pushed under 12, as denoted by the blue line in the following chart. Recently, hitting or going sub-12 tends to be a precursor to a spike in volatility but it is far from indicating a definite, imminent move. Maybe it’s my lack of statistical sophistication or inexperience in professional money management, but these 3 articles seem to be really stretching for evidence that a significant correction is not going to occur this summer and the breakout in the S&P 500 is 100% the real deal. I like to keep things simple, by observing the obvious signals. Market leaders at the time(biotech and small caps) broke down several months ago. Now they’re retracing to perfectly natural Fib. 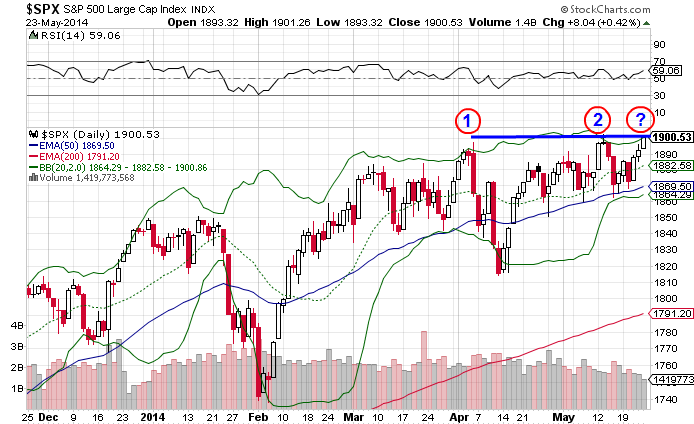 areas before potentially continuing downward which I think will have the effect of finally pulling the S&P 500 with them. Volume is anemic. The VIX is saying, “Wait a second here.” Is it because it’s the start of summer? All sorts of economic indicators have given a red light or at least a yellow light, despite all the cheer leaders. High yield fixed income keeps getting bid higher and higher with no downturn in sight. So many signals are readily apparent but we still need a trigger. In my last post, I thought that the high yield bond market may be the catalyst for a downturn in the S&P 500, but maybe it just finally gets pulled down with the risk indexes without junk correcting. What will the trigger be? Who knows? It could be anything. Maybe we get some sort of sell-off in another asset class causing a fixed income dash to cash, with the best returns being locked in from their high yield segments. Geopolitical activity may induce fears, although nobody in the markets seems to give a damn about the chess moves conducted by Russia or China. The markets continue to confound even the savviest. Well “chop & drop” is a pattern that is seen typically before major dislocations. John Hussman, Ph. D, who is consistently labeled as a perma-bear and broken clock, generates very good and widely read commentary that does skew to a negative outlook. He just calls it how he sees it based on his extensive research. Everybody’s got an opinion. It’s just a matter of whether you value it or not. I happen to value his commentary, but I don’t base my decisions on how I speculate by any one market commentator. It’s all about taking in as much as possible from as many credible sources as possible to assist one in firming up their own mental picture of the state of things. Anyways, he put out a piece recently titled, The Journeys of Sisyphus. Have a read if you’re in the mood for some confirming of your bias to your own negative outlook. 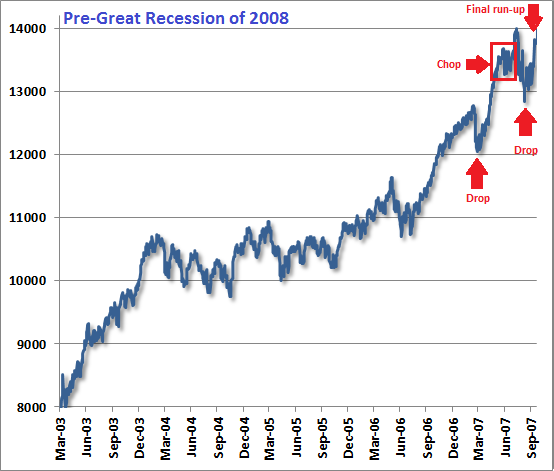 In the piece he produces several Dow Industrial Jones charts leading up to the major downturns of the last 85 years. For the record, he did not comment on any chopping and dropping in the post. I only reference his work because of the charts. My commentary is in no way affiliated with Dr. Hussman, nor has he endorsed this post in any shape or form. The first chart obviously displays 1929. In it you can observe the pattern of a notable correction with a recovery into some sideways chop followed by another notable correction leading into a final, euphoric run-up. This pattern of “chop & drop” almost always occurs in the final two years. Before presenting the rest of the charts, I am fully aware of the human brain’s abilities in the area of pattern recognition. It’s one of the distinguishing factors of our intelligence as a species, and is a key differentiator from the unevolved brains of other species as well as machines…for now. These set-ups could just as easily be illusory conjunctions of patterns established by a biased mind attempting to create the ability to foresee market outcomes. In other words, I could just be full of it. Believe me, I get that. I’m still going to present the rest of the charts and you the reader can establish your own outlook. 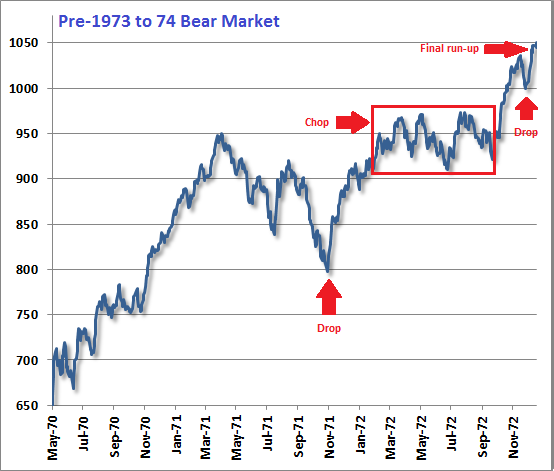 Here in 1972, we have the “chop & drop” but with a pseudo final run-up to sort of fakeout speculators. 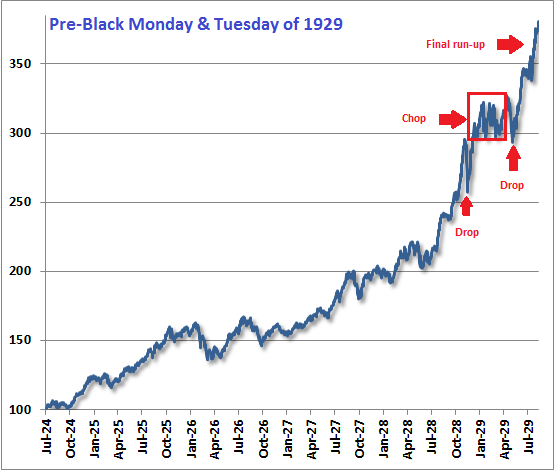 Compare this to 1929 where the chop went right into the final drop. 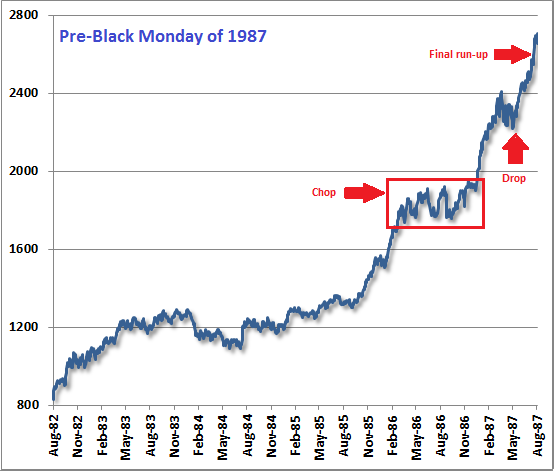 The action in 1987 lacked an initial heavy drop and recovery into the chop. Instead prices consolidated(or chopped) until that first drop before the extremely euphoric run-up prior to Black Monday. Finally, we’ve reached a time where a majority of readers may have actually had some money in play. The bust that started it all for a lot of us, the Dot.Com bust. 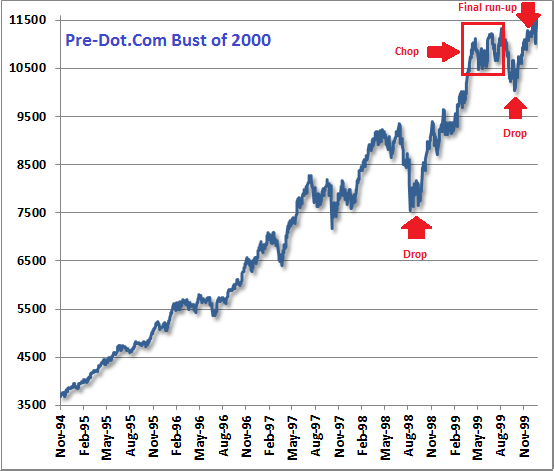 In 2007, the action was tight with the chopping and dropping occurring in less than a year. The outcome was still the same, a mega bust. In fact, if you think about the action of the dislocation it was kind of tight, too. All the action was essentially squeezed into 2008. Yes it began in November of 2007 and bottomed in March of 2009, but the real gut wrenching, heart breaking action occurred in 2008. And finally we come to the present, 2014. Now remember this whole exercise is pure speculation, but what I think we saw in that 6% correction in February was the first drop. We already recovered and have chopped along since then. At some point in the summer we could then move into a more serious drop of at least 10%. I suspect this may signify the last major drop before recovering into the final euphoric run-up which could last into 2016 before a major dislocation. Of course I run the risk of being wickedly wrong. But as I provide these posts free of charge and I do not manage money professionally, I’m ok with sticking my neck out and assessing the cycles of fear and greed as such. There’s no career risk. As for reputation risk, I’ll wait till my small following of readers can no longer be labeled small before I worry about my street cred. Just for kicks, here’s some statistics and notes regarding the Triple Top pattern from forex-tribe.com. It’s a good site to use for a little education into basic technical analysis patterns. However, they do not list where they obtained their data and how it was quantified. I was reluctant to even share it, but it’s just for kicks. If you’re relying on old school patterns without quantifying risk and reward ahead of time, well then shame on you. May closed out at a one-year high for the S&P 500. This is a very, very infrequent event; which is why the cliché “Sell in May and go away” even exists. Don’t be surprised if May selling just gets pushed back to June and July. Do not take your eye off the ball for any reason out there if you’re aggressively trading. For you long money players, take some time to consider the charts we reviewed today. Don’t discount that sovereign debts are at all-time highs across all the developed nations. Don’t discount that every major economy is monetizing debts or manipulating currencies via swaps or taking some other related action to sway economic activities. 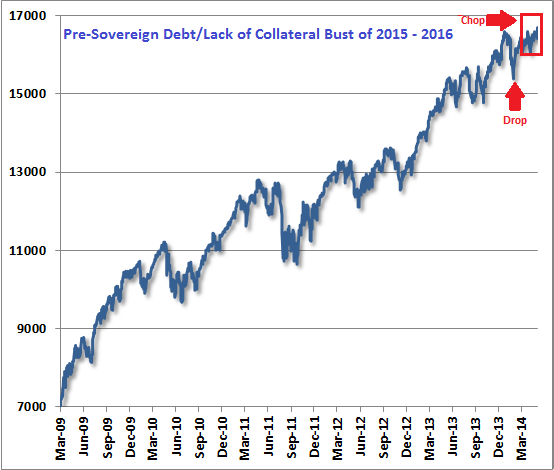 Don’t discount that credit derivatives exist in the hundreds of trillions with multiple collateral lines traced to multiple counter parties amongst the holders of said derivatives. Don’t discount negative GDP reads in developed nations. Don’t discount anything. Nothing is what it seems in the markets anymore and it could pay big to be prepared well in advance of what historical price action has already told us. I’m signing off but before I go, the biggest laugher of the week has to be that Italy and Great Britain are including prostitution and illegal drug sales in their respective GDP calculations. Seriously, you just can’t make this crap up anymore. Good day.